While we are inching closer to Christmas day, we are still working behind the scenes on our Spirit Tracks Walkthrough. We recently uploaded our complete text version of the guide at GameFAQs. We’re constantly making updates to both the text and site variations of the guide, aiming to make it a 100% guide, including all the side quests and collectible items. Stay tuned! However, there is a lot going on in the Zelda world outside of Zelda Dungeon. The February issue of Japanese gaming magazine, Nintendo Dream, will be featuring 100 pages of Zelda material! 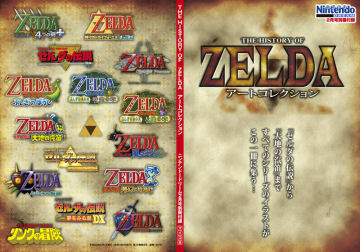 That’s right, it is going to have 100 pages of artwork and screenshots from all of the Zelda games to date! I’m a huge artwork fanatic and I’m excited to see this and hopefully get my hands on it soon! Hopefully we’ll have magazine scans soon! Within the Zelda fan site community itself, our friends over at LegendofZelda.com have recently launched a brand new layout too commemorate their 10th birthday.